Freon gas is described as a CFC (chlorofluorocarbon) that is associated with ozone depletion, which has resulted in the phase out of this product. Below is a bit of information on the uses of Freon gas. Freon is most commonly used in air-conditioning units as well as chest and upright freezers. In the commercial industries, there are several industrial and commercial appliances that make use of Freon for cold-storage warehouses and food transportation delivery vehicles. There are even dehumidifiers that use R-22. You are able to identify the type of coolant that your AC system uses on the nameplate of the unit. This information will tell you more about the unit which includes electrical ratings and safety certifications. AC units feature a system involving compressors and coils. 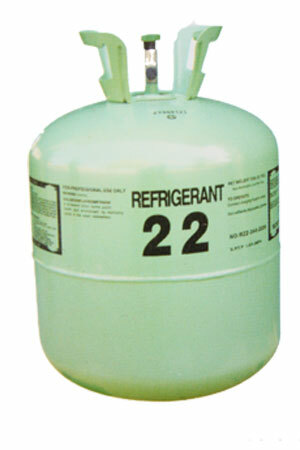 The AC is what compresses R-22 gas which makes it extremely hot. As the gas travels through the ACs coils, it will cool down into a liquid-form. In the liquid form, the cooled R-22 works on absorbing heat from the surrounding outside air. The unit then pushes this cold-air out. The system works on a consistent cycle of drawing hot air inside and pushing cold air out that results in comfort inside your car or home. All types of AC unit require a type of refrigerant in order to cool down the air. As soon as the coolant starts to leak, the AC is unable to blow out cold air. In addition, these leaks are also harmful when it comes to the ozone. The majority of the air-conditioners that were manufactured after the year 2003, no longer use Freon as a refrigerant. In addition, the strict regulations now in place for using Freon has made it a lot more expensive in order to maintain. As mentioned above, if you own a system which was released after the year 2003, it most likely already uses a refrigerant that is regarded as safer. If your system was manufactured after 2010, then you are guaranteed that a different refrigerant was used for cooling. Due to the phase out of Freon, it will become more and more expensive to carry on using this gas. The increase in costs are meant to encourage consumers to replace their older AC units with products regarded as more ozone-friendly. This will result in a decrease in repair costs as well as offering more efficient heating and cooling that also results in a saving on utility bills. At this stage you are not forced to stop the use of R-22, and the extended phase-out period has been implemented to offer home owners with more than enough time to transition to this switch as items in their homes become older. If you happen to own items that use Freon gas, it is advisable to ensure that they are maintained properly to decrease the harmful impacts on the ozone and the environment until you can afford to replace these items. To know more about us visit the website at http://www.bluonenergy.com/freon-replacement/.